Debt Free, Cashed Up and Laughing - The Cheapskates way to living the good life: Need Some Extra Money Fast? There comes a time in all our lives when we need a few extra dollars fast! An easy way to find extra money is to look around you. Do your children have toys they’ve barely touched or clothing they’ve outgrown that is still in good shape? Are there tools and utensils in your kitchen that you bought that are now taking up space? One great way to make a bit of extra money is to gather up all of the items you aren’t using anymore and hold a garage sale or yard sale. Make sure that everything is clean, well organized, and clearly priced before you hold your sale. You should have a sign that clearly announces the sale in your front yard and you may want to also place a classified ad in your local paper. To save on advertising costs and generate more interest, ask a few other neighbourhood mums or friends to chip in. 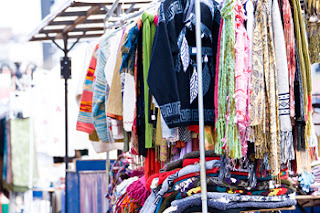 A garage sale is a great way to make fast bucks and declutter your home at the same time.